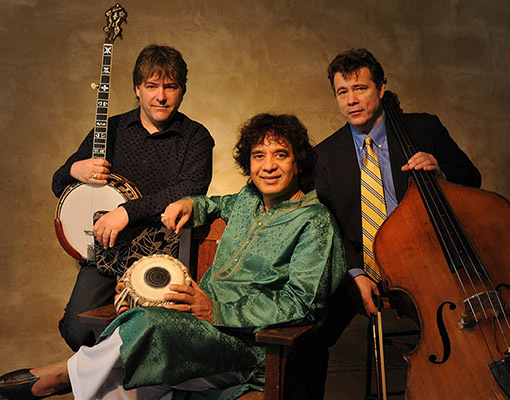 Three masterful genre-benders and the leading virtuosos on their respective instruments, Béla Fleck, Zakir Hussain and Edgar Meyer move with ease among the worlds of classical, bluegrass and world music. In the 2009-2010 season, they join together for the first time in trio concerts of original music. Three of the most limitless creators and composers in the history of music, Fleck, Hussain and Meyer share an unprecedented array of projects and pairings among them that touch every geographical and stylistic corner of the musical world. The trio will also release a recording in Fall 2009 featuring music performed on the tour alongside their innovative Triple Concerto for Banjo, Double Bass and Tabla.